Make plans this summer to enjoy the savory rewards this season brings. Grab your cooler, hop in the car and head out for a pleasant drive through the scenic rural areas of DeKalb County. Along the way, encounter a local farm stand or farmers market and look out for the colorful barn quilt proudly displayed on a family’s barn. “Visit DeKalb County and bring the farm to your home table,” invites Debbie Armstrong, executive director of DeKalb County Convention and Visitors Bureau. Be prepared to stop, shop and discover a bounty of fresh and local agricultural products close to home. Fill a sack with familiar favorites or try something new. Each farmers market offers its own special take on a variety of specially grown fruits and vegetables. Find the sweetest corn to butter up for the next dinner, picnic or outing. Forget the hot-house tomatoes this summer when the juiciest varieties of ripe-from-the-vine tomatoes are waiting to dress up a salad or sandwich. In addition to these tasty summer staples, most farmers markets offer their own specialty products, such as farm-fresh eggs; locally grown, fresh-from-the-beehive honey; and homemade condiments, relishes, jams, salsas and olive oils. Local artisans offer beautiful pottery selections to perk up any kitchen table decor; bouquets of richly scented, locally grown flowers are ready to enhance that special find. If you’re looking for another fascinating drive this summer, try learning about the barn quilt tradition while you take a self-guided tour along the DeKalb County Barn Quilt Trail. “The DeKalb County Convention & Visitors Bureau worked with the DeKalb County Farm Bureau and Bob Myers, of HAWK Arial Imagery, to curate a list of our county’s barn quilts,” explains Armstrong. What is a barn quilt? It’s a single, uniquely designed quilt-style block typically painted on a detachable canvas and displayed on the side of a barn or other farm structure. Each barn quilt is custom designed. It can highlight the owner’s family history or hobbies, reflect patriotism, represent local or family quilt designs, or honor a family pet. Each one is created straight from the heart. 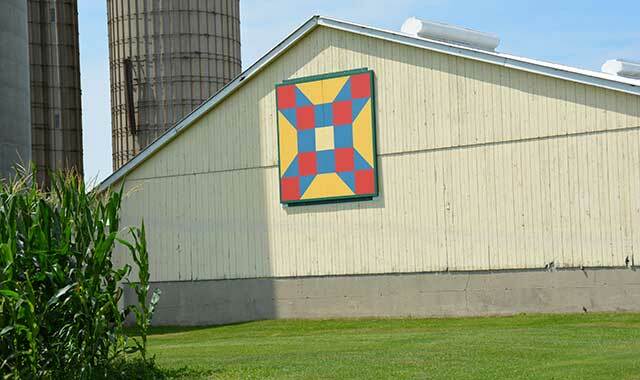 The barn quilt movement started with a star quilt fashioned in 2001 by Donna Sue Groves in Ohio. “Today, that movement has taken root in DeKalb County, where 40-plus barn quilts are scattered on farms throughout the county,” adds Armstrong. The DeKalb County Barn Quilt Trail is broken into five distinctive legs, allowing visitors to explore the self-guided tour at their own pace. “The trail is a great complement to pair with the DeKalb County Barn Tour event taking place on Aug. 11,” adds Armstrong. This one-day driving tour of select barn sites is jointly hosted by the DeKalb Agricultural Heritage Association and the Joseph F. Glidden Homestead and Historical Center. For more information on local farmers markets, barn quilts and many a scenic summer drive, visit dekalbcountycvb.com. The Geneva Inn, in Lake Geneva, is resurrecting its supper club menu, delivering numerous supper club staples and a three-course menu. There’s still time to make an ordinary summer something extraordinary. Melt the stress away while discovering the grand traditions and pampering services of a longtime favorite lakeside location. And you won’t need to board an airplane to get there. The Geneva Inn, in Lake Geneva, is reinventing itself and adding several unique lakeside comforts for guests and vacationers to enjoy. This popular year-round retreat, located on the scenic shores of Geneva Lake, is unveiling inventive ways to bring back great traditions that honor its heritage. New patio amenities, revitalized turn-down services, and the return of an old dining favorite make the panoramic lakeside views and spectacular colors of a sunset even sweeter to embrace this summer. The patio food and drink menu has also been transformed. Enjoy delectable offerings such as chopped salads, burgers, seafood and more from the Geneva Inn’s own food truck. The Geneva Inn is already well-known for its charming accommodations and award-winning cuisine. Now, it’s taking a big step forward in resurrecting a famed dining destination. A welcome surprise is the addition of an all-new Supper Club portion of the menu. “It will both satisfy appetites and bring back nostalgic memories of a timeless, tried-and-true Wisconsin tradition and experience,” adds O’Dempsey. The menu will include tempting Wisconsin supper club staples and a three-course menu with your choice of soup or salad, entree and a dessert. Savor a Grandview Salad with spinach, fennel, strawberry, candied pecan and goat cheese, dressed with honey chive vinaigrette. Enjoy the comfort of the made-in-house soup du jour. 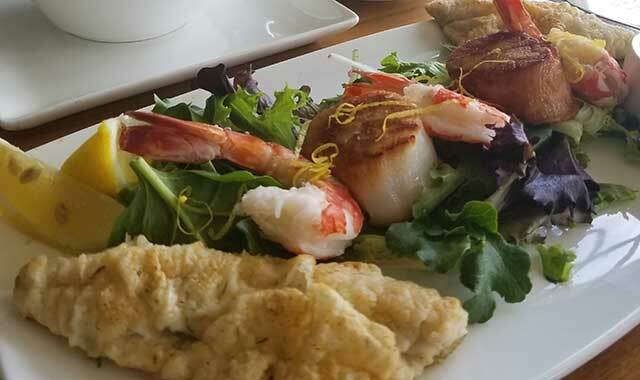 Indulge taste buds with a succulent steak or seafood platter. Sip a sweet handcrafted brandy mixed into an Old Fashioned cocktail. The cozy waterfront restaurant with a refreshed environment is a popular dining destination, in part because it offers a relaxed and elegant atmosphere for breakfast, lunch and dinner any time of the year. Of course, it also delivers those unexpected and much-appreciated views of Geneva Lake. For more information, and to set a dining reservation, visit genevainn.com or call (262) 248-5680. September and October are two excellent months to visit Starved Rock Lodge. Guests can still feel the warmth of the summer while taking in the beautiful fall colors. Weekday getaways are the best way to enjoy Starved Rock Lodge and State Park, in Oglesby, Ill. It’s a jewel in the crown among the Midwest’s unique attractions in part because of its seasonal waterfalls, a system of 18 deep canyons and the architectural craftsmanship of the historic Lodge. Sleeping late in a room or cabin where you can open the windows is just one reason to spend the night. A walk in the woods away from cellphones and traffic jams can do wonders for your peace of mind. You can treat yourself to some quality downtime or you can have fun when you book an add-on tour, hike or other activity. September and October are perhaps the two best months to book a getaway because the warmth of summer is still in the air, but the colors of fall add to the picturesque beauty of this natural wonder. The Lodge offers daily trolley tours departing at 3 p.m. through October and on weekends through December. This is an excellent way to learn about the rich history of the Starved Rock area. 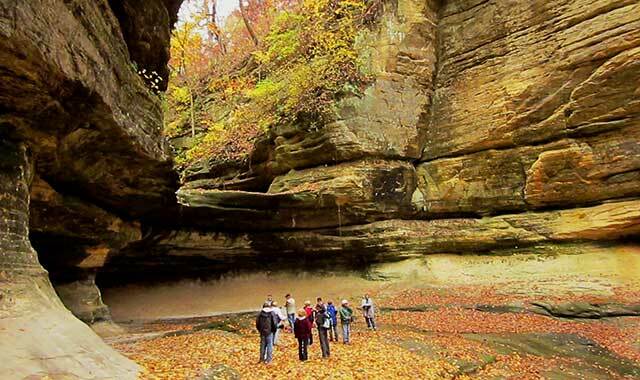 Weekend guided hikes called “Take a Hike & a Lunch” travel on a scenic walk along the banks of the Illinois River and into LaSalle Canyon. Leisurely adventures on The Eagle I River Boat are perfect for guests of all ages. Choose a Land & Water Cruise, which includes lunch in the dining room on Mondays and Fridays or a Dinner and Evening Cruise on Mondays and Thursdays. If you want to add a hike, the “Visit a Canyon with a Boat Ride” is the best choice and it’s offered on Saturdays and Sundays. If you’re interested in a real challenge, take on the Fall MegaHike, where you can traverse all 18 of the park’s canyons in one day. This 13-mile trek takes place Sept. 29-30, with two departures per day. The Valley Carvers hosts its 30th Annual Woodcarving Expo in the Great Hall and Starved Rock Room on Sept. 30. Admission is free and includes an outdoor woodcarving demonstration, which happens from 9 a.m. to 4 p.m. At 2 p.m., there will be a keg tapping on the Veranda to kick off the fall season with select craft beer. German music will fill the air. Views of the Illinois River Valley are outstanding from the veranda this time of year. Tribute to the Stars matinees continue this fall with a Patsy Cline show Sept. 12, classic gospel hymns performed by the The Kramers Sept. 17-18, and a tribute to Elvis on Oct. 1-2. “Hike for a Cure” is the Lodge’s annual fundraiser where proceeds are donated to Relay for Life for breast cancer research. Fall Colors Trolley Tours run throughout October. Fall Colors Weekend and the Lodge’s annual Oktoberfest Dinners take place Oct. 20-21, with an Oktoberfest matinee on Oct. 22. Details, departure times and more are listed at starvedrocklodge.com or by calling (800) 868-7625. This entry was posted on Friday, August 17th, 2018 at 11:59 am	and is filed under Recreation & Destinations. You can follow any responses to this entry through the RSS 2.0 feed. Both comments and pings are currently closed.